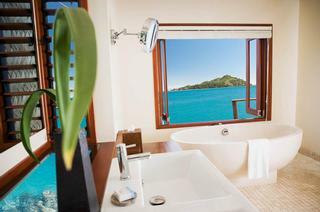 If your idea of a perfect vacation is soaking in your own private bath tub while enjoying the view, head to one of these amazing resorts with the most beautiful overwater bathrooms. 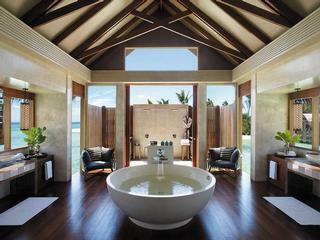 You may also like: 18 Most Beautiful Spa Baths and Pools. Not only does the window at Likuliku open to reveal a fantastic view of the lagoon, the bathroom itself has a specialy glass window through which you can look straight down into the lagoon and admire the abundant sea life. The overwater bungalows at Anantara Veli Resort Maldives feature incredible over water bathrooms where you can soak literally on the edge of the ocean. Cool off in the blue lagoon, snorkel with tropical fish, followed by a relaxing soak in the square tub. 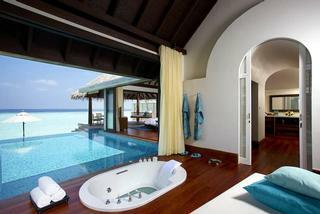 Enjoy all around water views at the Island Hideaway at Dhonakuli Maldives. 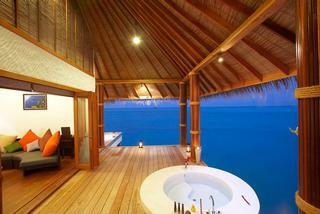 The round tub on the edge of the deck makes you feel like you are floating above the ocean. The indoor - outdoor bathoom at Coco Bodu Hithi Maldives has a spacious outdoor deck where you can relax in plush lounge chairs with a view of the water. 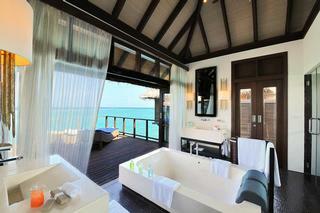 There is a privacy curtain that lets you enjoy a soak in your luxurious overwater villa. 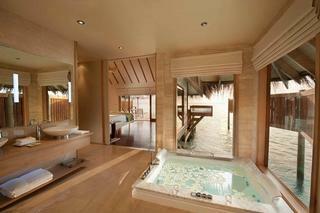 The Premier Water Villa Bathroom at Conrad Maldives is surrounded by water. A designer tub sits next to two floor-to-ceiling windows on the ocean's edge. The spacious overwater villas at Gili Lankanfushi Maldives are completely surrounded with water, including the spacious bathroom with a deep soaking tub. Whether you are waking up in the morning or getting ready for dinner at night, you will be surrounded by stunning ocean views. 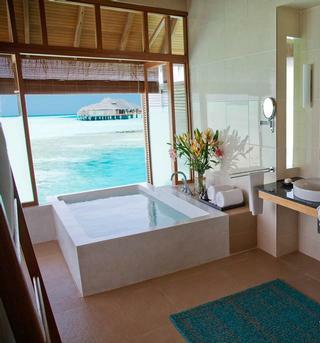 The Water Suite Bathroom at Velassaru Maldives is spacious and luxurious, complete with hard wood floors and a spacious round tub in the center of the room. The bathroom has two walk-in rain showers and high ceilings which give you a great sense of space. The open-floor layout at Anantara Kihavah Villas lets you enjoy every nook in the villa withough loosing the connection with the surrounding ocean. 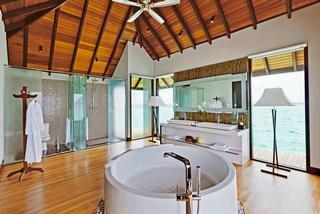 The luxurious tub at the edge of the private infinity pool offers an inviting space for relaxation. The giant oval wooden tub at Laucala is one of the largest we've seen, offering open-air relaxation over the ocean. Combining rustic and elegant, the tub was designed to blend with the beautiful nature that surrounds it. 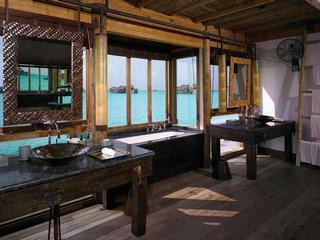 This stunning overwater bathroom at Shangri-La Villingili Maldives has a spacious indoor area with a giant round tub, his and hers vanity areas and windows overlooking the lagoon. The outdoor area of the bathroom features two beautiful rain showers, perfect for cooling off in the middle of the day. Next Read: 25 Most Amazing Private Pools.